There are now 42 constituents in the strategy and cash level is Zero. The biggest gainer this FY is MEP at near +85% while top loser is SIMPLEXINF at -14%. 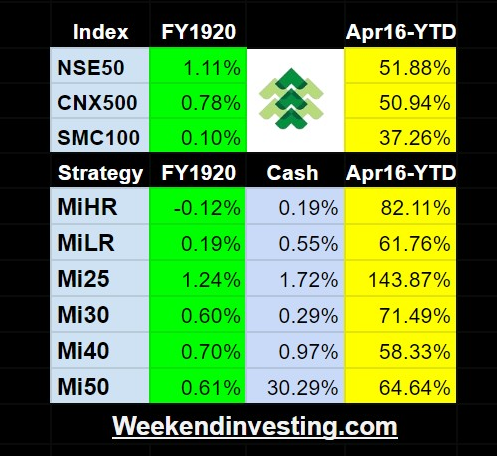 The strategy has under-performed the indices this month. This strategy is lagging my other strategy Mi25 so far this year. A new strategy Mi40 is intended to be launched shortly in month of Aug 2017. The Mi50 strategy remains open for new entrants. Do write in to alok@weekendinvesting.com or visit weekendinvesting.com for further queries. What will make you think smallcap index itself has made some intermediate top? What is the highest % gain for a week till date in Mi50? My Indicators suggest we are entering final 6-8 weeks of euphoric zone in Smallcap Index so asked.